This Tuesday, the 27th is GivingTuesday 2018. 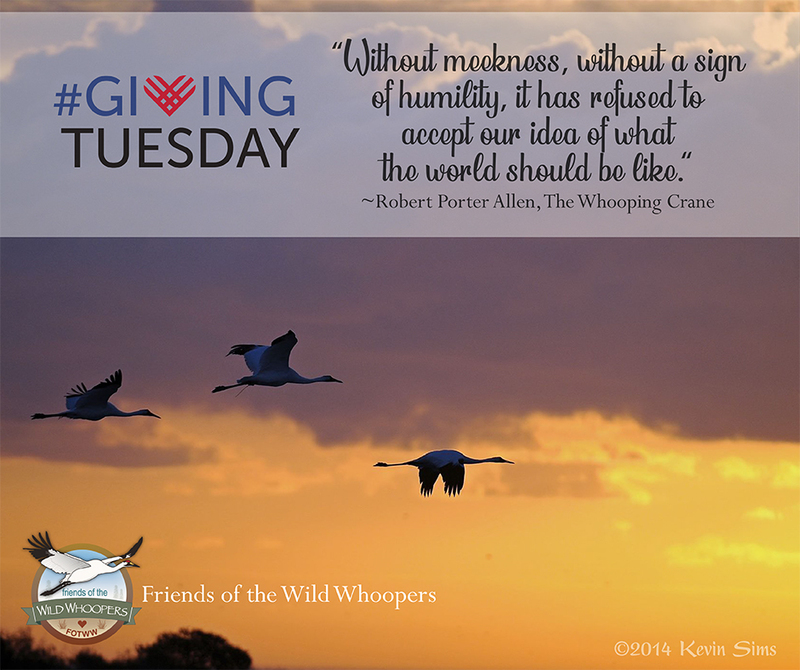 If you are considering giving on GivingTuesday, please consider giving to Friends of the Wild Whoopers, (FOTWW). FOTWW has completed “stopover habitat” evaluations on 32 military facilities, 8 Indian Reservations and 12 U.S. Army Corps of Engineers lakes within the wild Whooping Crane six state migration corridor. All of the evaluations were done at no cost to the facilities, reservations or USACE, but were made possible by donations from our supporters who believe in our mission. Our “stopover habitat” is in its infancy with many lakes and potential habitats remaining to be evaluated. Every donation that we receive is greatly appreciated and will go toward Whooping Crane conservation and our ongoing “stopover habitat” efforts to help preserve and protect the Aransas/Wood Buffalo population of wild whooping cranes and their habitat. After Thanksgiving, we had and survived Black Friday and Cyber Monday. Today, November 29th, is Giving Tuesday, a day dedicated as a global day of giving. Please join in on this growing tradition of Giving Tuesday by supporting Whooping Crane conservation and Friends of the Wild Whoopers, (FOTWW). By making a donation to FOTWW, you are supporting our work and efforts to ensure that the natural wild flock of Whooping Cranes and their habitat will be protected and healthy and that these magnificent cranes will always grace our skies and lands. Won’t you please make a donation to FOTWW? If you wish to make a donation, please click on the “Donate” button, under the cover photo of our Facebook page or visit our website, and click on the “Donate” button there. For those who may not be totally familiar with FOTWW; We can assure you that 100% of your donation is for on the ground conservation/habitat management efforts because FOTWW is a 501(c)(3) non-profit and is an all volunteer organization, whose staff receives no salaries. Help us, help the only natural wild flock of Whooping Cranes!